It’s your boy, Al à la Carte here stepping in with my debut post. I need no further introduction than for you to know that I am that guy. So let’s get into this thing man. This is the bathroom, where Satan also watches you pee. I was accompanied by a mid 20’s female for the occasion. We will call her MuMu. She takes pride in the act of eating things that are not animals. I had heard of this sort of behavior before but had never really seen it in action to be honest. Lettuce, carrots and things of that nature are used as decoration in my world, a way to bring further color to what is usually just a brown and red meal. Garnish being the centerpiece of a dish? My mind reeled at the thought. As we entered the restaurant we were greeted by an over eager young man who gave us the choice of sitting above or at ground level. I chose above to gain a better idea of the venue. Once seated, we ordered quickly: A Veggie Burger with fries and water for her, Salmon BLT on whole wheat with fries and a lemonade for me. Being a sort of lemonade connoisseur I have to say that the beverage I received was well above average. It was certainly made by an unloving, unattended machine but had the distinctive texture of having actual lemon juice in it. A feat that is, unfortunately, not matched by most establishments. The water MuMu received came in a glass but was filtered, Schuylkill Punch fans look elsewhere for your fix. The food came out quickly. Too quickly. Disaster struck as my companion noticed she was given the Veggie Sandwich and not the Veggie Burger she had ordered! Who knew eating plants was so nuanced? The gaff was corrected quickly enough, so I didn’t have to feel too guilty about eating while she watched. The BLT is a simple sandwich, but toss in Salmon and it becomes a battle between meat for top billing. The Salmon was well done, slightly burnt on the edges and also a little on the dry side but the juices from the bacon made up for it and the sandwich was tasty enough overall to win my vote of approval. The fries were nothing special, cooked well, a few burnt. Your standard affair, potato skin on. Ain’t no meat on that plate. MuMu reacted quite well to the Veggie Burger. The patty looked like a mish-mashed thing-a-mob with random vegetables poking out of its orifice. My companion took it in stride so I assumed it was quite normal. After only a few minutes it was reduced to mere crumbs. Devil’s Alley is therefore herbivore approved. In all, the visit was positive and the food was cheap. Be sure to add Devil’s Alley to your list if you’re looking for a no frills brunch while Satan watches you eat. Situated right on the edge of the historic Independence Hall district, Jones is poised to attract plenty of touristy stragglers who walked up an appetite leering busily at the Liberty Bell or attempting to peer in the windows of the place where the Continental Congresses commenced constructing the Constitution. Based on it’s pedigree as a Stephen Starr restaurant, it draws out-of-towners and inner-city hipsters alike (I assume, as both were evident Sunday night, along with a healthy helping of young urban professionals). The main draw is the menu of comfort foods, such as baked mac’n’cheese, chicken’n’waffles, meatloaf’n’mashed potatoes, steak’n’fries…notice a pattern here? Also, you can have give thanks even in July with the Thanksgiving Dinner. Also available are soups, sandwiches, burgers, and a variety of champagne drinks, mixed liquors, and beer both micro- and macro-brew. Desserts seem plentiful from the menu, but just expensive enough to not try after a good-sized meal. There are even vegetarian options, such as the soy burger. Speaking of burgers, on my first trip to Jones I decided to try the ol’ standby of a beef burger with fries (&10.50), while my dining partner went with the Soy offering. Garnishings include: lettuce, tomato, dill pickle, and carmelized onions, which is a nice departure from the norm. Both burgers were served quickly, even though the place was packed, so the staff seems to be on the ball. My burger (pictured above) was prepared medium-rare (I asked for medium-well but apparently that doesn’t exist?! ), covered in a thick slice of white Cheddar cheese, and served on a grill-toasted bun (a big plus if tastes is what you’re after…probably not if you’re watching your caloric intake). The hand-cut fries were on the soft side of crispy, but tasty nonetheless. I imagine they were cooked in peanut oil. I also imagine that I could discern the type of oil used by taste. The soy burger was served much the same way, cheese and all, though it wasn’t red on the inside (would have added a smidgen of authenticity, or at least freaked the hell out of a passing vegan). Both burgers tasted well, nothing too special, except for the buns; I thought that grilling them added a nice smoky flavor to the whole deal, but solidly delicious. I’d have to rank the beef burger over Ruby Tuesday’s in terms of flavor, though RT’s patty might be just a tad bigger. One knock for me was the consistency of the bread used: the rolls seem to be a bit airy (almost croissanty in texture); what can I say, I like big buns and I cannot lie. I decided to have a Yards Pale Ale with my meal (a departure from my old standby Yuengling Lager), and the lighter taste blended well with the heavier meat and cheese flavor. A surprise was the choice of bottled water or good ol’ Schuylkill Punch, so we all know which I chose as a born-and-bred Phillyite. Overall, the experience was enjoyable, the drinks chilled, and the burgers well prepared and tasty. I look forward to going back one day to check out some of the comfort food offerings…I know a few diners that could probably teach Jones a thing or two about that! Some of the prices could stand to be a bit more recession-friendly for the offerings, but the high quality ingredients seem to justify the price. The burgers ran about $10, champagne cocktail $8, beer $6. Despite it’s seemingly average menu pricing, Cracker Barrel is a great place to get a lot of good food without breaking your budget. 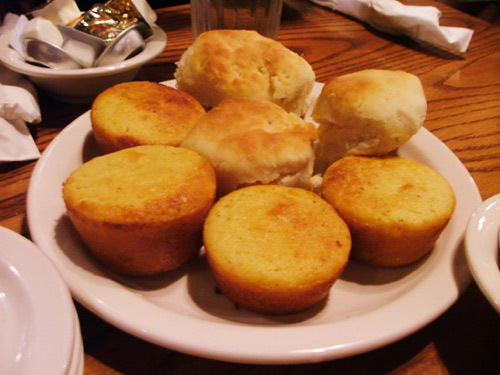 Every meal begins with a plate of biscuits and cornbread, which is served on the house. Amazingly, they’ll happily provide you with additional platefuls for the exceptionally reasonable price of *nothing*. The biscuits are fantastic. If you’ve eaten biscuits at fast food chicken joints like Popeye’s and KFC, you’ll know what to expect. Cover them in butter for maximum enjoyment! Most of the entrees come with 2-3 side dishes, which include things like mashed potatoes, steak fries, and veggies. My personal favorite combo of side dishes is mac & cheese, dumplings, and fried apples — all are delicious. 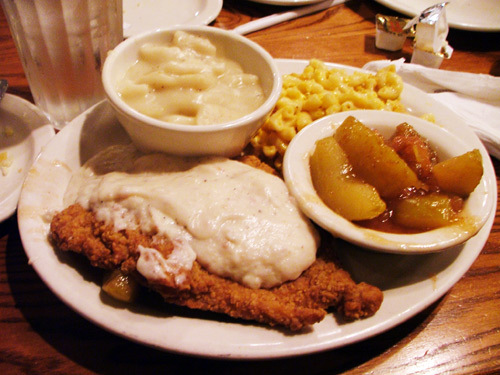 The mainstay of the Cracker Barrel repertoire is Chicken Fried Chicken ($8.99). It may be one of the most delicious meat platters known to man. It consists of a juicy boneless chicken breast, breaded and fried. A healthy smattering of equally delicious sawmill gravy is spread on top, which amplifies the juiciness of the chicken and provides additional flavor. 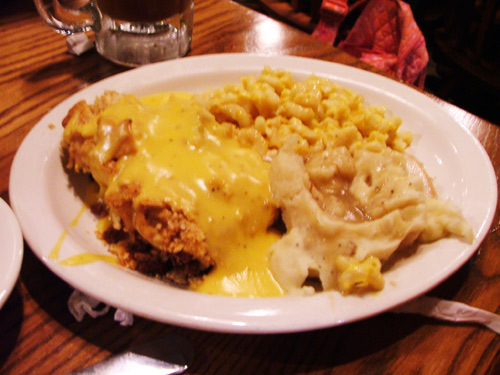 It’s similar to the Chicken Fried Chicken, but it’s been baked with sweet apple spices, a cheese sauce, and Ritz Crackers. The Cheddar sauce gave plenty of flavor to the dish on it’s own, but the ‘burnt’ Ritz sprinkled about overpowered even the flavor of the chicken. Unless you’re a HUGE cracker fan (or have no working taste buds left), I’d hold the Ritz. 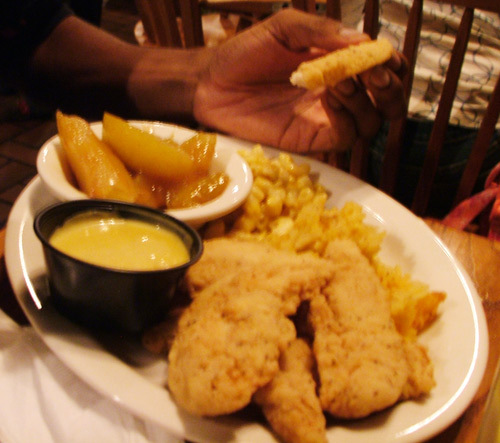 Al chose the Chicken Tenderloins, ($8.99) which are six large hunks of chicken either marinated grilled or breaded and deep fried. If it’s one thing Cracker Barrel does right, it’s chicken. You absolutely cannot go wrong with any poultry on their menu. I was a little apprehensive to order something other than the mainstay of Chicken Fried Chicken but was immediately satisfied upon the first bite that was dipped in the delicious honey mustard sauce. The tenderloins are just like a bigger and better version of Micky D’s Chicken Nuggets, all white meat and properly covered in goodness. Fried Apples and Mac & Cheese seal the deal. Top notch eatin’. Way more satisfying that it initially appears. Even the most voracious eaters will leave will a full stomach. Yes, it’s a chain theme restaurant, but hot damn is their food tasty. Though you get the idea they’ve been honed through packaged seminars, the staff is always pleasant and agreeable. The food always comes out *remarkably* quickly. $9 entrees don’t seen like a fantastic deal, but the addition of 2-3 side dishes at no extra cost sweetens the arrangement. Be sure to make use of the recurring biscuits and cornbread! The decor is hokey “olde-timey” fluff, but it’s not particularly offensive. What is offensive, however, is the smoking section. Those who request a non-smoking seat still have a good chance of being seated within the radius of smoketown USA. It can put a damper on an otherwise great eating experience.